Search engine optimisation plays a big role in promoting content online. Hiring SEO services is certainly not a waste of money for businesses. However, optimisation can only generate traffic to your site. It does not actually convert this traffic into customers. Also, the traffic generated doesn’t necessarily come from your target audience. So, if you want to truly improve sales or followers for a website, you need to combine search engine optimisation with conversion rate optimisation. CRO tactics can directly influence your visitors to become customers. It can also narrow your traffic down to people who are actually interested in what the site is offering. Therefore, your online marketing strategy must include CRO along with search engine optimisation. Search engine algorithms are constantly updated to be more sophisticated than they were several months ago. These algorithms are just as good as people when it comes to distinguishing bad sites from good sites. So, having thousands of keywords, backlinks, or online content does not really matter for generating traffic or improving rankings for your site. What truly matters is the quality. All the content you publish must be of top-notch quality for search engines to recognize you. For example, one backlink from a legitimate news site is of more worth than ten backlinks from “citizen journalism” sites. Also, using the right keyword sparingly is the best way to get better ranking; not cramming one too many keywords onto a single page. Additionally, the text on your web pages should be free of errors in grammar, spelling, or facts to be effective. Therefore, do not waste time and money increasing the quantity of the web content. Focus on the quality instead. The future of digital marketing lies with mobile phones. People now use smartphones to browse the web just as much they do using desktops or laptops. There are more loyal buyers on smartphones than on computers. Also, businesses can reach customers directly with smartphones. People are also more likely to consume advertising on their smartphones. For all these reasons and more, you must extend your digital marketing strategy to mobile phones as well. Invest in designing an app and making your site responsive to mobile. Incorporate a texting campaign to your e-mail campaign. Likewise, research new ways to penetrate the mobile market. Don’t limit your promotions to text ads and short online articles. Learn to use other media tools like video as well. Video is a great way to grab attention and get shares on social media platforms. You can easily create great marketing video using editing software without spending much money. Use images, music, and other eye-catching mediums to attract and retain users. 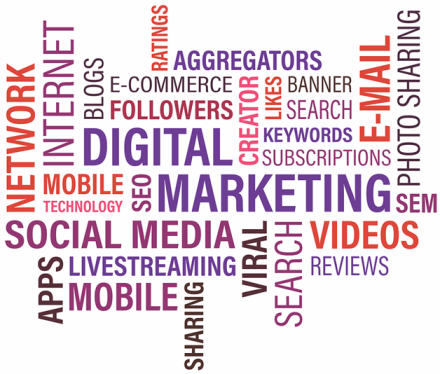 As you have just read, digital marketing is a complex subject with many different sub topics. You will need to gradually learn them. A good marketer knows which tools to use depending on the target audience. Learn the basics first, and then move forward.